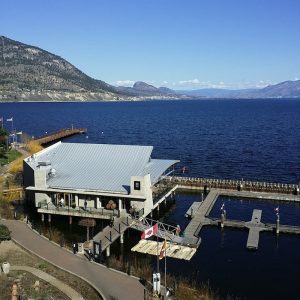 After doing some travel planning for the Easter Long Weekend, we decided to stay in Canada instead of going through customs so we started focusing in on the Okanagan Valley for its beautiful landscape and uncomplicated attractions. 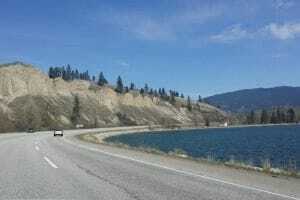 In particular, it was the Penticton Lakeshore Resort and Casino which seemed to capture hubby’s attention. He found this hotel online and seemed really captivated by the beautiful lakeview from the rooms. To be honest, I was not too impressed with it by the photos I saw but I was very busy and didn’t have time to override his grand plans lol. 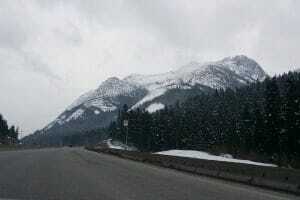 So Easter weekend comes around and off to the Okanagan we go. In the end, we actually had a tremendously wonderful time! We didn’t have to rush across the border to mindlessly stalk the US malls to buy more material things we didn’t really need. But spent the time on a relaxing drive down in which we passed through several distinct types of landscapes, the cute animals we got to play with and much more. All of it provided a nice laid back getaway that left us fully recharged by the time we came home. The hotel that brought us to Penticton. Although I wasn’t very invested in staying here at first, I quickly changed my mind as soon as I stepped into the room and saw the view from our balcony. It is tremendously beautiful! I love water views that are lined with architecture (I find endless ocean bodies really creepy). From the balcony, you have a view of the beach, the resort’s own dock restaurant and the opposing mountains with the white a-la-Hollywood letters spelling out “Penticton”. The property itself has a smallish casino, nightclub and two restaurants. 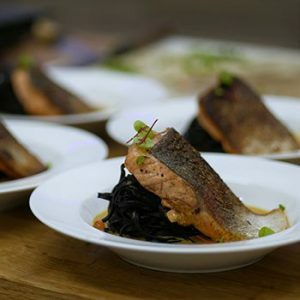 We had the opportunity to eat at the dock restaurant, the Hooded Merganser, a few times and the food was actually pretty good and the best part again was the water view. It’s the same one you can enjoy from your room but with close ups of wildlife like little ducks fishing and floating on the water. I would definitely stay here again if I just wanted to relax. It has enough amenities for a simple weekend getaway. 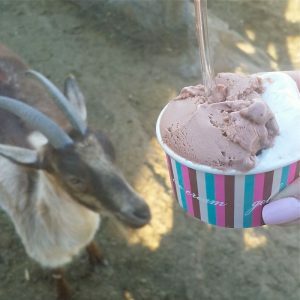 Have you ever tried goat’s milk ice cream? I can say that this was my first time. In the quest for a more interesting culinary experience, we decided to try goat’s milk ice cream. I’m not sure if goat’s milk ice cream is easy to come by normally but we just treated the farm visit as an excursion in our trip and it turned out to be quite a nice experience. 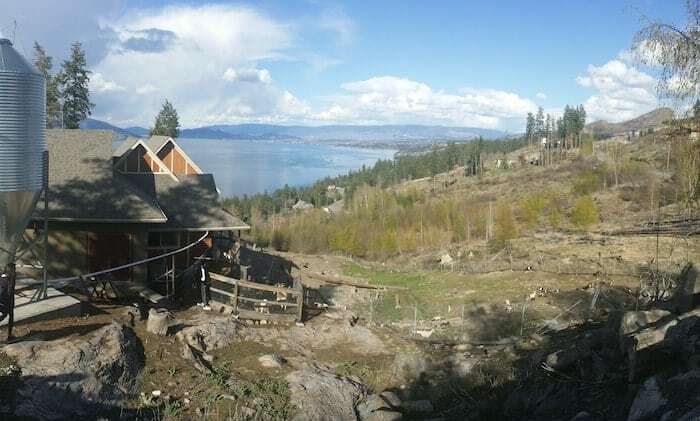 The farm is actually situated on top of a somewhat steep hill overlooking a beautiful lake. The goats roam free in a huge pasture area which is fenced off. There is also a tasting room where you can taste test a variety of goat cheeses and ice cream made from goat’s milk. Surprisingly, there were many interesting flavours to choose from including, Skor, Ferrero Chocolate and Strawberry Cheesecake. Somehow, I had thought that the offerings would be more “country” like. Although, I cannot imagine what those would be lol. After grabbing some ice cream, we headed outside to watch the goats and we even gave this little guy a petting from over the fence. When we started to leave, he used his hooves to scratch the fence and even tried to jump up to get our attention. To his delight, we turned around and petted him some more. It was truly a sweet moment. In my adult life, I had never given much thought to the animals that provided us with our food. This experience really left an impression on me. Oh my! This was the highlight of our trip. 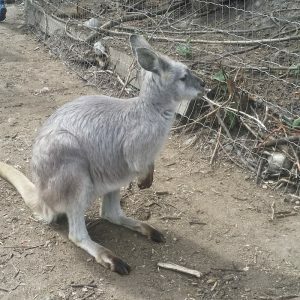 For a donation, you can enter this small farm to pet extremely cute and mild mannered animals like kangaroos, wallabys, capybaras and more. 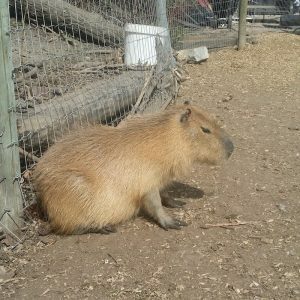 The animals roam freely on the grounds and there are plenty of them for you to feed or pet. I was pleasantly surprised at was how calm kangaroos are. Although I had been in close proximity to huge Kangaroos taller than me in New Zealand, I did not have an opportunity to pet them at that time. What I knew about kangaroos was from the funny YouTube videos showing how rambunctiouse they could be as they bounced into the air and kicked unsuspecting victims with both of their hind legs. It seems that there was definitely some unfair stereotyping on my part there, right? I didn’t know that kangaroos were actually so receptive to petting from random strangers. Unlike some dogs that get easily excited, these knee high kangaroos remain very calm. Thus, I think they make the perfect animal to introduce to your toddler or children. 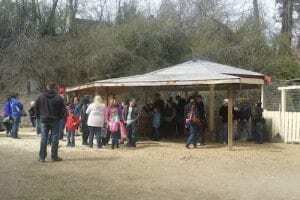 There is also a separate sheltered area where you can hold onto baby kangaroos wrapped in cozy blankets! 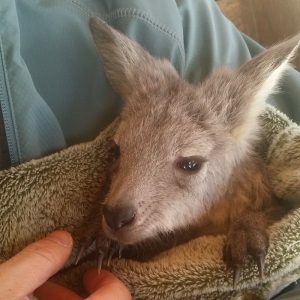 The Kangaroo Creek Farm is definitely something I would recommend for all animal lovers and families. 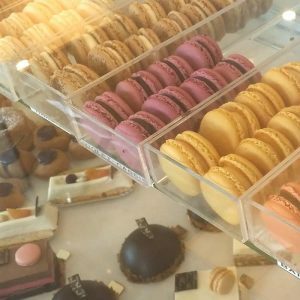 Saving the sweetest (literally) for last – Sandrine’s French Patisserie – the only place in Kelowna where you can buy French macarons. It’s become somewhat of a “thing” for me to do when I travel now (or even locally in Vancouver). 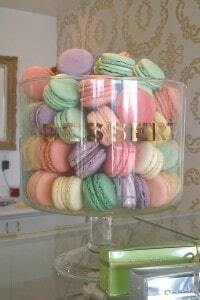 I make a point to stop by to get macarons wherever I am. 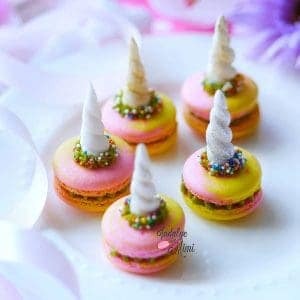 You all know I’m obsessed with baking macarons and it should only be fitting that I do my “homework” and taste test as many as I can. 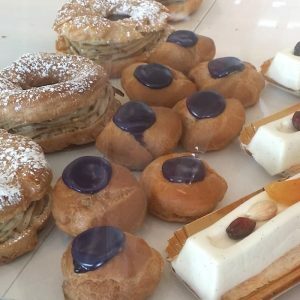 Now I know, Kelowna is not Paris and no one would ever think to go to Kelowna to get macarons but this French-owned patisserie is pretty legit. The few macs I had were very good. 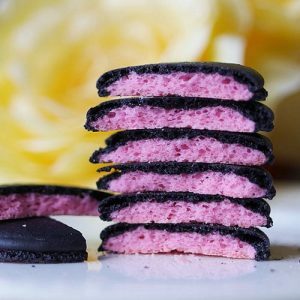 They were filled with jams and ganaches that were not sickenly sweet. The shells were moderate in size and fully set. I hear that their other French dessert offerings are also delicious. 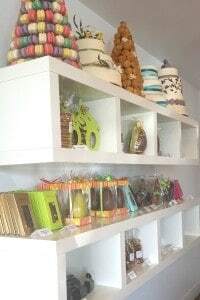 It’s a nice place to stop by for desserts or an afternoon treat. 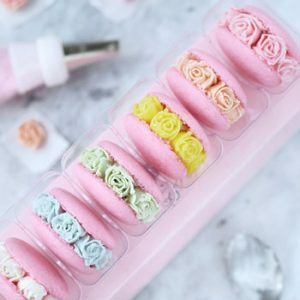 Next time you return from Kelowna, you can add macarons onto your list of souvenirs for the non-drinkers in your life. Well, bye for now since I need to start heading down to Hong Kong for my next trip. 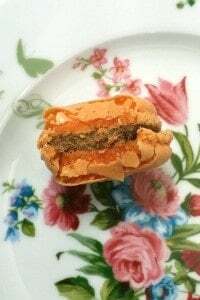 Wait for my posts of macaron powerhouses L’aduree and Pierre Herme!